To read the NEJM piece, please hit this link. A piece in JAMA looks at what would be needed in future expansion of bundled-payments programs. The authors consider such things as extending bundle durations to a year; the role of bundled-payments programs outside the hospital, especially as efforts intensify to reduce readmissions, and ensuring that Accountable Care Organizations and bundles are adequately integrated and coordinated by aligning incentives and sharing information on shared patients. 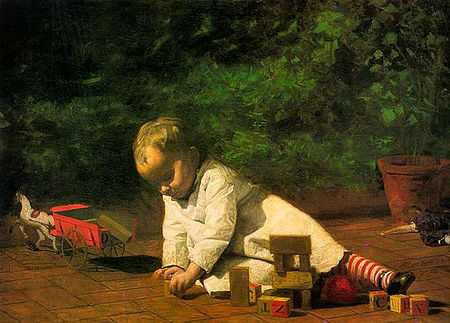 “Baby at Play,” by Thomas Eakins (1876). Win Whitcomb, M.D., writing in Hospitals & Health Networks, presents what he calls five “building blocks of success” in bundled payments. He is chief medical officer at Remedy Partners, in Darien, Conn.; an assistant professor of medicine at the University of Massachusetts Medical School, and a founder and a past president of the Society of Hospital Medicine. To read more, please hit this link. 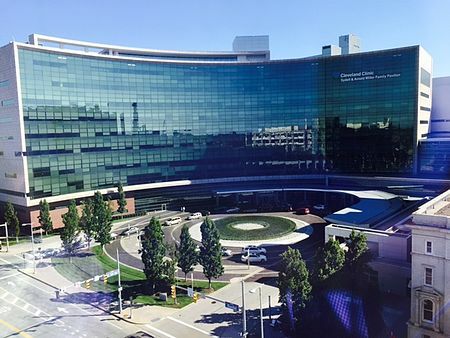 The main building of the Cleveland Clinic. “During a discussion at the SAS Health Analytics Virtual Forum, leaders with the Cleveland Clinic and Humana emphasized the importance of data partnerships as the healthcare industry continues to transition toward innovative payment models. New initiatives—like bundled payments for hip and knee replacements—have forced providers to re-engineer their approach to care, a transformation that relies on the ability to analyze and interpret patient data to provide more personalized care. “Previous payment models created ‘adversarial relationships’ between payers and providers, said Chris Donovan, executive director of enterprise information management and analytics at the Cleveland Clinic. Now, those same companies take on an equal share of risk, which has fostered new data-driven partnerships. Whatever the Republican efforts to kill the Affordable Care Act, some healthcare changes encouraged by the ACA that have particularly developed over the past few years will almost certainly continue, predicts The New York Times. Early intervention through much expanded community-health efforts that address the social determinants of health. Alternative payment models, such as bundled payments, in a continued move away from fee for service and to fee for value and outcomes. More emphasis on care coordination and team-based care, including better coordination between clinicians and outside social services. To read The New York Times piece, please hit this link. A study in the Journal of the American Medical Association found that bundled payments for joint replacements can cut costs by up to 20.8 percent without hurting patients’ medical outcomes. 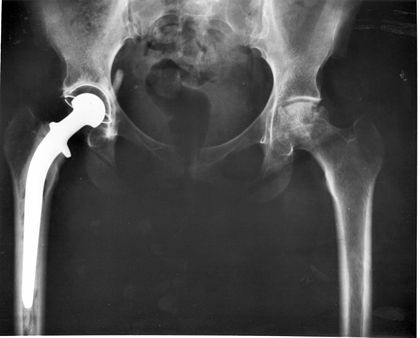 The system achieved on average $5,577 in savings per joint-replacement episode. During a seven-year period, Baptist Health System cut average Medicare costs by 20.8 percent for 3,738 joint replacements without complications. For 204 episodes with complications, Medicare episode outlays fell an average 13.8 percent. Episodes that required prolonged lengths of stay fell 67 percent. Study researchers projected that if every hospital used the Baptist bundled-payment model, Medicare could save $2 billion a year. For the study, researchers used Medicare claims to analyze 3,924 lower-extremity-joint-replacement procedures at San Antonio-based Baptist Health System between July 2008 and June 2015. The patients participated in CMS’s voluntary Acute Care Episodes and Bundled Payments for Care Improvement demonstration projects. To read the JAMA article, please hit this link. A recent change in how Medicare pays for joint replacements is saving millions of dollars annually — and could save billions — without impacting patient care, a new study has found. But the man whom Donald Trump has picked to be the secretary of the Department of Health and Human Services has vocally opposed the new mandatory payment program and is likely to revoke it. Under the new program, Medicare effectively agrees to pay hospitals a set fee — a bundled payment — for all care related to hip- or knee-replacement surgery, from the time of the surgery until 90 days after. Traditionally hospitals collect payments for many components of care and rehabilitation individually. Tom Price, M.D., the president elect’s HHS nominee, a congressman from Georgia and a very affluent orthopedic surgeon, has actively opposed the idea of mandating bundled payments for these orthopedic operations, calling it “experimenting with Americans’ health,” in a letter to the Medicare agency just last September. In addition, the agency which designed and implemented the experiment, the Center for Medicare and Medicaid Innovation, was created by the Affordable Care Act to devise new methods for encouraging cost-effective care. It will disappear if the act is repealed, as President-elect Trump has promised to do. The study appeared Jan. 3 in the Journal of the American Medical Association. Though one of its authors is Ezekiel Emanuel, M.D., a professor at the University of Pennsylvania who helped design the ACA, the research relies on Medicare claims data from 2008 through mid-2015, long before the presidential election. Starting in April 2016, CMS required around 800 hospitals in 67 cities to use the bundled payment model for joint replacements and 90 days of care after the surgery as part of the Comprehensive Care for Joint Replacement program. The program had previously been road-tested on a smaller number of hospitals on a voluntary basis, which formed the focus of the research. The study found that hospitals saved an average of 8 percent under the program, and some saved much more. Price has been skeptical that bundled payments did save money, but the researchers estimate that if every hospital used this model, it would save Medicare $2 billion annually. 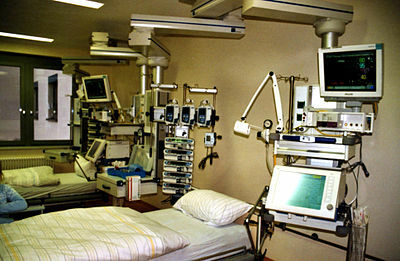 The bundled payment program works like this: For some specific kinds of medical procedures, including joint replacements or some heart surgeries, the Centers for Medicare & Medicaid Services will add up the costs for the entire episode, from the hospital stay and medical supplies to the rehabilitation afterwards. If the total costs are below a target set by CMS, the hospital gets to keep the savings. If not, the hospital has to pay Medicare the difference. It’s supposed to incentivize more efficient spending and better care coordination between providers, so they can lower costs. In practice, it seems to be working. Baptist Health System, a network of five hospitals in San Antonio, saved an average of $5,577 on each joint replacement without sacrificing the quality of care, according to the study. Baptist was an early adopter of bundled payments; it began experimenting with them in 2008. Over seven years, the hospital system has cut Medicare’s costs on knee replacements by almost 21 percent. The savings came without impacting quality. Patients at Baptist Health System were just as likely to be readmitted to the hospital or end up in the emergency room as patients nationally. There was some indication that quality of care may be better, fewer patients under bundled payments had long, extended hospital stays. In Price’s letter from September, he said that Medicare had exceeded its powers in imposing such bundled payments, which he said took decisions out of the hands of doctors and patients. That doesn’t seem to be the case, according to Amol Navathe, M.D., an assistant professor of medicine and health policy at the University of Pennsylvania, and one of the authors of the JAMA study. Instead, Navathe and his colleagues suggest that the bundled payments actually fostered greater collaboration between surgeons, administrators and patients because programs could only succeed in saving money if physicians were engaged in creating standardized pathways for care. For example, the Baptist Health System saved about 30 percent on implant costs, around $2,000 on each artificial joint, by using the least expensive medically equivalent implants as determined by the hospitals’ surgeons. Usually, physicians are prevented from benefitting when hospitals save money because of anti-kickback laws. Waivers under bundled-payment models mean that surgeons can put in the time to find the best, most cost-effective implants, and share in some of that savings. When bundles included care after a patient’s hospital stay, spending on rehabilitation went down 54 percent. That’s because hospitals took the time to match patients to the right level of care, Navathe said. Patients who didn’t need to stay in a nursing home or rehab center were set up with home health care or physical therapy. Price has objected to CMS making bundled payments mandatory, calling it an instance of federal overreach. But bundled payments only work if everyone has to participate, according to Darshak Sanghavi, M.D., the former director of prevention and population health at the Center for Medicare and Medicaid Innovation. If hospitals can choose whether or not to participate, only the ones that are already delivering care efficiently –and coming in under CMS’s cost target — will use bundles and Medicare will constantly be paying out bonuses. The system needs to be mandatory, Sanghavi said, to pull in less efficient hospitals and give them incentive to change. “Stopping the programs for ideological reasons I think impedes innovation in a way that is going to consign us to having really, really high costs of care that’s going to continue in the future,” Sanghavi said. Bundled payments aren’t just for hip and knee replacements. On Dec. 20, CMS announced it would expand mandatory bundled payments to treatments for heart attacks, bypass surgery and cardiac rehab beginning in July 2017. In its waning days, the Obama administration is effectively throwing down the gauntlet to the incoming administration on bundled payments, one of its signature reforms. To read the whole piece, please hit this link.